It's 2019 and The Big Indie Pitch is back with a bang. Of course, as always we'll be kicking off the year with our bumper jam-packed flagship Very Big Indie Pitch at Pocket Gamer Connects London. However, this is just the start of what is already set to another record-breaking year. So where are we off to first? Well, for those of you who can't make it to Pocket Gamer Connects London on January 21st to 22nd, we've also got another UK-based Big Indie Pitch lined up as we head to the brand new Interactive Futures show on February 1st. We're then following this up by returning to the show floor of the White Nights conference. Previously having been a part of the Prague and St. Petersburg shows, this time we're joining White Nights in the heart of Berlin on February 12th to 13th. Of course, that's not all though as in March we're heading back to the United States for our ever-popular GDC Big Indie Pitch, which this year enters its seventh year. This pitch is one that promises to fill fast so developers should get their entries in as soon as possible. This year we'll also be bringing our PC-focused PC Indie Pitch to the world famous show for the first time. However, this isn't our only American based pitch in March. As this year we're stopping off in Austin, Texas just before GDC to host our first ever Big Indie Pitch at SXSW to ensure that nobody misses out on the chance to pitch their latest creation to our expert judges and potentially win a prize or two. Of course we'll have a lot more pitches than just those Q1 pitches featured here, and a selection of those later in the year can be found at the bottom of this article, with more being announced as the year goes on. So, come and join us, as we put the spotlight on some of the most exciting mobile and PC indie developers from the whole world over in a range of pitches. Details on how to register including links can be found at the end of this article. Not only is this a perfect opportunity for indie developers of all shapes and sizes, both regionally and internationally, to show off their latest game to a range of industry experts including journalists, investors, publishers and renowned indie developers, but it’s also a prime networking opportunity, and a great chance to get involved in an exciting conference as well. Oh, did we mention that it's free to enter and that every developer will receive guaranteed editorial coverage and written feedback? There’s also be brand new prizes too that have been tailored specifically for the indie community, and all of our developers will be entered into consideration for the next Big Indie Awards! We have many a regular entering the Big Indie Pitch, but most of our entrants are brand new to the event. So, if you’re one of those developers who has never entered the Big Indie Pitch before, you may be wondering just how it works. Well, if that’s the case, then let me explain. The Big Indie Pitch process couldn’t be simpler. Developers come along with their games in hand, before being given five minutes to pitch their title to the first of five judge tables. Once the time is up, a horn will sound and it’s time to move onto the next table and do it all over again. Once developers have seen all five tables their turn is over and it's time for the next set of developers begin their pitches. 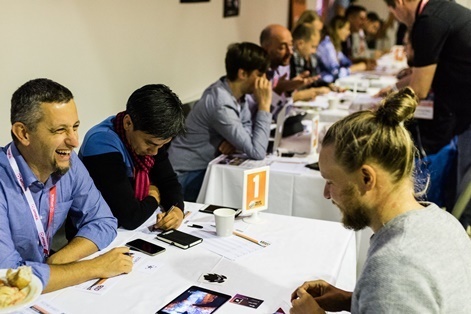 All in all, it’s a unique chance to place your game into the hands of some of the most influential minds in the industry and receive immediate feedback on your game over the course of the meeting. Following the pitch we’ll also collect up all of the feedback and email this over to you so you have a written record of just what the judges liked about the game, alongside some tips and advice on how they think you could grow it as you move forward with development. We’ll be covering every game in our round-up piece over on PocketGamer.co.uk and we’ll be conducting interviews with the top three which will be published right here on PocketGamer.Biz. Finally, those we’ll also have a range of prizes on offer at both pitches for the top three developers. Prizes which the lucky developers will be able to use across our portfolio of websites in order to market and promote their game, alongside free tickets to a Pocket Gamer Connects of your choice. Interested, but not sure if you qualify? Oh and did we mention it's completely free too? Hopefully this sounds as exciting to you as it does to us, as we're really looking forward to highlighting indie developers from the whole world over. We look forward to seeing you all there. Oh, and don’t forget to bring your business cards. More coming soon so make sure to regularly check our upcoming events page here and over on BigIndiePitch.com. The Big Indie Pitch interviews: What does it take to make a game all about esports?